Living in the South, it is already heating up here as Spring gets into full bloom While some parts of the US are bundling up in sweaters and jackets, we’re lounging by the pool with our flip-flops on. No matter what Mother Nature has in store for you this week, take a few moments to relax with an iced (or hot!) coffee and enjoy reading these links from around the web. Are chalk drawings the same as graffiti? 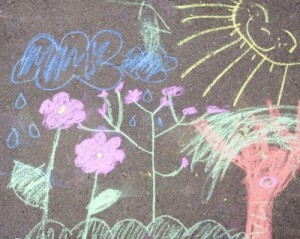 According to one area’s council, simple children’s drawings on the sidewalk amount to graffiti and are illegal to do. A toddler’s fall was luckily broken by bushes growing outside. The 4-year-old girl fell three stories and survived with only a few bruises and scrapes thanks to the sturdy plants below. Do you see breastfeeding mothers as incompetent? A new study says most people view mothers that choose to breastfeed as less competent than those who don’t. A new heating wrap for premature infants has debuted in India. The simple yet effective wrap is much less than the cost of an incubator, but helps keep babies warm just as well. Infant massage may bring a lot of health benefits to babies, according to researchers. Can pregnancy help cure an eating disorder? For one mom having a baby was enough for her to battle her food demons and win. Traveling with your kids? Rated by mom looks at 4 backpacks that allow them to carrying their own weight. New trend? Parents are turning to online websites to Plan playdates while they’re on vacation.